The KLIS Engineer in Chief, N Venkateswarlu and other officials performed formal Puja there before releasing water into the gravity canal. 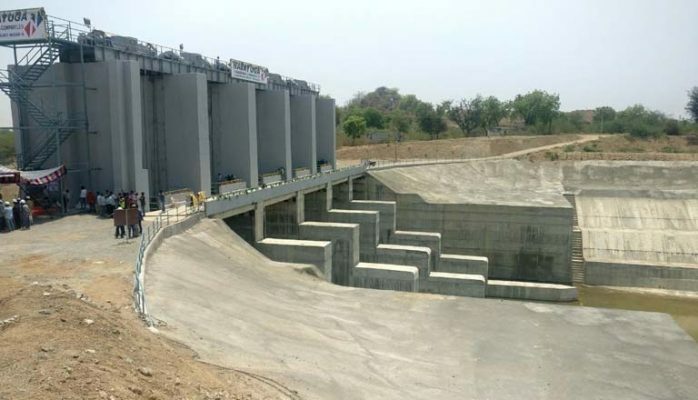 Hyderabad: The Mega Kaleshawaram Lift Irrigation Scheme reached a key mile stone on Wednesday with the project authorities releasing water from Sripada Yellampali project to facilitate wet run of the pumping stations in Package 6 of the project. Water routed through the gravity canal and the 9.5 km long underground tunnel, will be used for filling the surge pool at Nandimedaram. The surge pool impounding is expected to be a week- long exercise which will culminate in the wet run of the pumping stations. The underground pump house complex has come up with seven pumps of 124.5 MW each meant for lifting water vertically some 110 meters up on a 45 – degree gradient to the delivery cistern. Out of seven pumps installed in the package, four are ready for the wet run and two more will be ready soon. Civil works on pump No 7 are expected to be completed soon. It will be in commissioning stage by June 15. KLIS Package six which involved an overall cost of Rs 4,961 crore will provide vital connectivity from the lift irrigation scheme to Nandimedaram project, the halfway point to the mid-Manair project, from where the water flow branches off in the designed directions to irrigate over 37 lakh acres. The KLIS Engineer in Chief, N Venkateswarlu and other officials of the project performed formal Puja at the point before releasing water into the gravity canal.